EARLY VOTING starts on Monday, May 2nd, 2011 and goes through May 10th, 2011. Hours are 8:00 to 5:00. 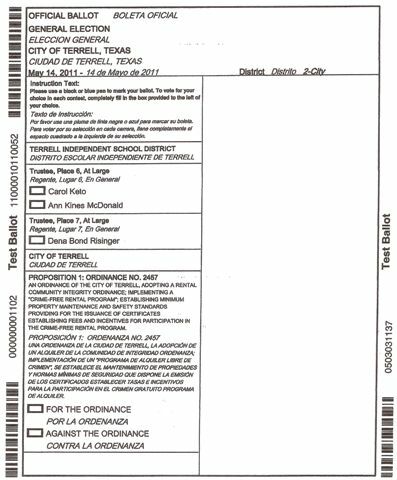 Early voting takes place in only one place: CITY HALL/COUNCIL CHAMBERS (where police department is housed and the fire department for Terrell, Texas). CITY HALL physical address is: 201 East Nash Street. For May 14th, go to your regular polling places. Voting hours on May 14th will be 7am to 7pm. How can I find out who and what is on the ballot? The ballot will soon be posted on this website. It might possibly be in the Terrell Tribune. I think it is required that it be printed in the newspaper. I don't know if this means the day before the election, or not. Look for it on here very soon, please. I am not sure where to say this, but, I will post it here and hope people see it. I thank the City Manager, Torry Edwards, for ALWAYS returning my phone calls. I have said before how much I appreciate the time our (in our area of town ) Council Member has also been helpful to me and returned and taken my phone calls. I haven't called any other Council Members so I am not leaving them out on purpose. I hope the Council Member in your area is also easy to get in touch with and willing to talk to you. They do not get paid (Council Members) and work for free so their time is appreciated that they put in to talk to us, and to attend meetings. It cracks me up to see the words "Crime Free" on this. Oh that's good. You mean because with a day or 2 notice of the "inspection", as we were told it would be, someone on drugs could have their act cleaned up by the time the inspector showed up ? Any way of helping with crime I am at a loss to come up with. That's great! i try to do that myself with all of the blogs that I run one of my niche blogs have goettn a post a day for the last 2 years and the impressions it gets from organic traffic is very impressive! From the perspective of a chrcuh board chairman, here is a question I would like explored: Is is possible for today's chrcuh board' and multi-pastoral staff' structures to line up with the New Testament description and example of leadership by elders in the local chrcuh? The various New Testament passages that address or describe elders or that describe the qualifications of elders and overseers seem to point to the same group of men referred to most commonly as elders. Whether one reads Paul's or Peter's or James' letters or Luke's description of the early Church there seems to be a common understanding that under the Headship of Christ the local chrcuh is led, fed, taught, served and directed by a body of elders. In today's world where chrcuhes become government approved societies with boards and directors reporting back to the government and where boards are required to be distinct from pastoral staff, is there any way for local chrcuhes to establish a model of governance' that more closely resembles what we see in the New Testament? Normally I'm against killing but this article slgerhteaud my ignorance. All times are EDT. The time is now 02:15 am.